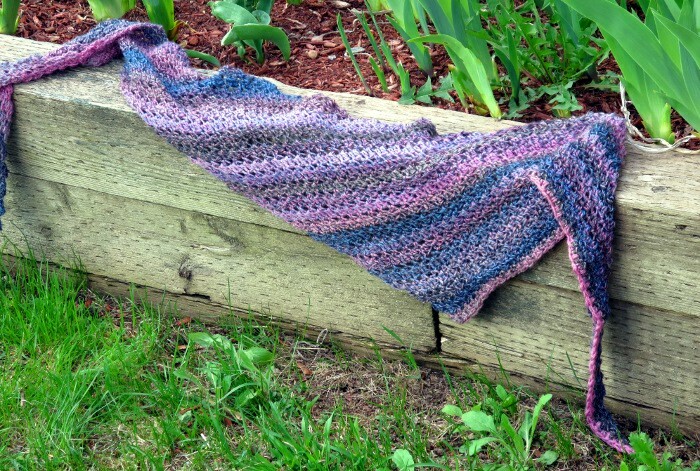 Ever since Snowdrop came out in Crochetvolution, I’ve wanted to revisit the shawl for a lacier, more upscale version. I still wanted to keep the asymmetrical shape and wanted to keep it extremely easy to make, and you had to be able to use any yarn and any hook to make it. A simple stitch change was all it took. Heavy blocking is needed to open up the lace pattern, so using a fiber you feel comfortable with blocking is a must. NOTE: Shawl is worked sideways, starting with only a few stitches, and can be made any size. Row 1: Sc in 2nd ch from hook. *Sk next ch, sc in next ch. Repeat from * once more: 3 sc made. Row 2: Ch 1, turn; sc in first sc. *Dc in ch-1 sp, sc in next sc. Repeat from * once more: 3 sc and 2 dc made. Row 3: Ch 5, turn; sc in 2nd ch from hook. Ch 1, sk next ch, sc in next ch. Ch 1, sk next ch, sc in next sc. Ch 1, sk next dc, sc in next sc. Leave last 2 stitches unworked: 4 sc made. Row 4: Ch 1, turn; sc in first sc. *Dc in next ch-1 sp, sc in next sc. Repeat from * across: 4 sc and 3 dc made. Row 5: Ch 5, turn; sc in 2nd ch from hook. Ch 1, sk next ch, sc in next ch, ch 1, sk next ch. *Sc in next sc, ch 1, sk next dc. Repeat from * across until 2 stitches remain. Leave last 2 stitches unworked. Row 6: Ch 1, turn; sc in first sc. *Dc in next ch-1 sp, sc in next sc. Repeat from * across. Repeat Rows 5 and 6 as many times as desired. Finishing: End off. Weave in ends. Block to open up the lace pattern. Anastacia Zittel loves to crochet, knit, dye yarn, weave, garden, read, and can food from her garden. She’s a member of the CGOA and she’s also a certified knit and crochet teacher through the Craft Guild of America. She also loves to read fantasy & historical fiction. 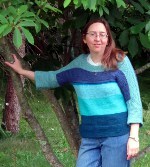 She enjoys writing about her crafty adventures at Anastacia Knits Designs. She’s been designing seriously since summer, 2010. 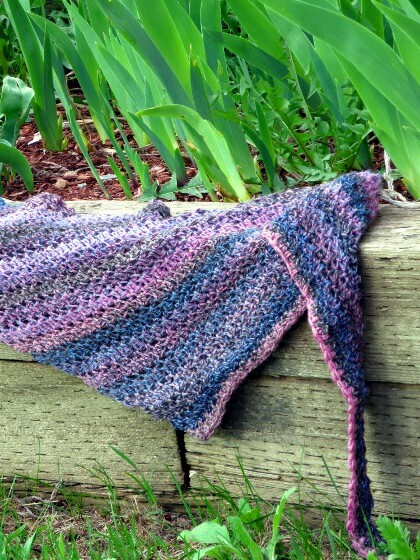 I just can’t wait to make this shawl! I made two with the Snowdrop pattern, and both are wonderful results. Thanks again so very much Anastacia!